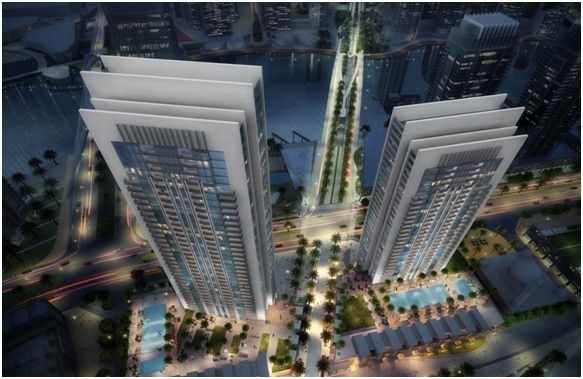 Harbour Gate is a new launch by Dubai's no.1 developer – "Emaar Properties". Harbour Gate is located in prime location on The Island District next to Dubai Creek Harbour’s Central Park with a waterfront views. 1 Bedroom, 2 Bedroom & 3 Bedroom options are available in this project where the size varies from678 square feet to 2,017 square feet. The surrounding of the project as well as its stunning design and architecture makes it most iconic developmentin Creek Harbour area. The new tower is going to take place in the same location beside Tower 1 of harbour Gate. The completion of the project is expected by the year 2020. Harbour Gate is a high rise tower availing the apartments of different sizes from 1 BR to 3 BR with Balcony.The project will also feature six penthouses on the upper floors and six townhouse duplex homes on the podium pool deck level.The total area 1 BR apartment has is of 678.13 sq.ft, 2 BR Total area ranges from 1,212 sq ft & 3 BR from 1,648 sq ft. The development is surrounded by ample amenities that include private pools, gym, children’s area, private parking and a landscaped leisure deck. Emaar Properties is known as one of the world’s most renowned real estate developers for changing the face of Dubai. Emaar has set an impressive track-record in developing and delivering world-class homes in the UAE. It is the master developer of Downtown Dubai among others developer. The company was founded by Mohamed Ali Rashed Al-Abbar on June 23, 1997 and is headquartered in Dubai, United Arab Emirates.Almost 37,350 residential units were handed over by Emaar in Dubai and many more to come. Emaar Properties is a Public Joint Stock Company listed on the Dubai Financial Market. Dubai Creek Harbour is a joint development by Emaar Properties and Dubai Holding. This community is well connected to major roads and only a 10 minute drive from Downtown Dubai. Creek Harbour is a great and unique combination of high rise towers & parks. A place where nature meets art provides its residents & visitors chance to enjoy life in idyllic surroundings close to water and nature which is truly remarkable. Creek Harbour Gate Tower is situated in The Island District at Dubai Creek Harbour, Dubai City, UAE. The project provides high-end amenities and is strategically located next to Dubai Creek Harbour’s Central Park where residents can enjoy its beautiful parks/waterways,swimming pool, relaxation lounge, multipurpose room, games room and children’s play area, Common courtyard, Common garden, Common terrace, Concierge service, Doorman, Garage, Gymnasium, High-speed internet, Infinity, Pool, Jacuzzi, Meeting room, Overflow pool, Reception service, Sauna, Smart home technology, Standard pool, Steam room, Video security and the other main features.